Jon Challinor (left) is caretaker-manager for Stamford AFC's game at Coaliville. Deeping Rangers can move up to fourth place in the United Counties Premier Division with a home win over Wisbech Town tonight (November 10). Three points would put Deeping within three points of Holbeach United who are in action against Boston Town at Carter’s Park tomorrow (November 11). 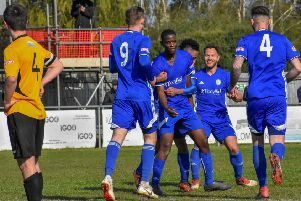 Yaxley have a tricky home game against Sleaford tonight, but Peterborough Northern Star will expect to beat lowly Harrowby United at Chestnut Avenue. Managerless Stamford AFC and Spalding United have Doodson Cup ties this evening. The Doodson Cup is the knockout competition for Evo Stik League side. Northern Premier Division strugglers Stamford AFC, who lost their first game under senior player Jon Challinor 4-0 at the weekend (November 7), are away to promotion-chasing Division One South outfit Coalville Town. And Division One South side Spalding, who won their first game under caretaker-manager Marcus Ebdon 5-0, host top-flight Matlock. Challinor was pleased with the spirit his side showed on Saturday, but he doesn’t expect to be in the job for long. The Daniels are preparing a short-list to replace Andrew Wilson who was sacked after 10 games and 40 days in charge. Potential candidates Graham Drury and Paddy Rayment watched Stamford on Saturday. Drury is a former Stamford manager, while Rayment parted company with Spalding last week.